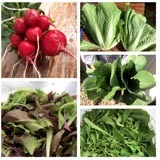 Hooray for the warmer weather this week which allowed us to harvest Salad Mix again. It also made our big job of planting garlic this past weekend a little nicer. So far, we have planted about 11,700 cloves of garlic. Only 2,700 left to plant, which we will finish sometime this week. Sweet onions have a shorter shelf life due to their higher water and sugar content. It is important to store them properly as they require more care. Select the highest quality of sweet onions to store, preferably with intact outer layers. Treat them gently to avoid bruising. Store away from potatoes because they'll absorb water. Sweet onions store best in cool, but not cold, temperatures, about 50 to 55 degrees F, with relatively low humidity. Ideally, sweet onions should be stored in a cool, dark, dry location and spread out for optimum air circulation. This can be done on an elevated rack or screen. Or, several sources recommend placing onions into the leg of a clean pair of pantyhose, with knots tied in between each onion, and then hung in a cool, dry, well-ventilated place. When you need an onion, simply cut the hose right below the end knot. To keep sweet onions longer in a refrigerator, store in a single layer on paper towels in the vegetable bins. The Vadalia Onion Committee claims sweet onions wrapped individually in foil will last as long as a year in the refrigerator. Discard onions (or cut off "rotten spot) with obvious mold or discolored soft spots. Sprouting is another indication of age and/or poor storage. Yet, if the sweet onions have sprouted, you can use the green sprouts as a substitute for scallions even if the flesh may be useless. Although sweet onions are best eaten raw, they can also be chopped and frozen for future cooking uses, with no blanching necessary. This is another long-term storage option, however, the onion's texture changes so frozen onions should only be used for cooking. Chop onion, place pieces on a cookie sheet, and place in the freezer. When pieces are frozen, place in freezer containers or bags. Frozen onions begin to lose their flavor after about twelve months in the freezer. I also dry onions in my food dehydrator which we cook with throughout the winter months. Does anyone else have any tried-and-true storage methods for prolonging the life of their produce? Again, the weather has had an impact on what we were able to harvest for your shares this week. No snow this time, but plenty of rain. This time of year, I find myself checking the weather forecast before I make out a harvest schedule. Problem is that the weather keeps changing and the forecasts aren't always accurate. So now I make plan A, plan B, etc. and hope for the best. Fortunately, rainy days lend themselves well to harvesting crops growing in the greenhouses, like fillet beans and tomatoes. There were a few of us that ended up doing some work in the rain, but thankfully not too much. Speaking of being thankful, the potatoes are in! And I am so very grateful for the dedicated workers and dry days which enabled this big job to go so very well. We had all the potatoes dug up and in the shed by Friday. 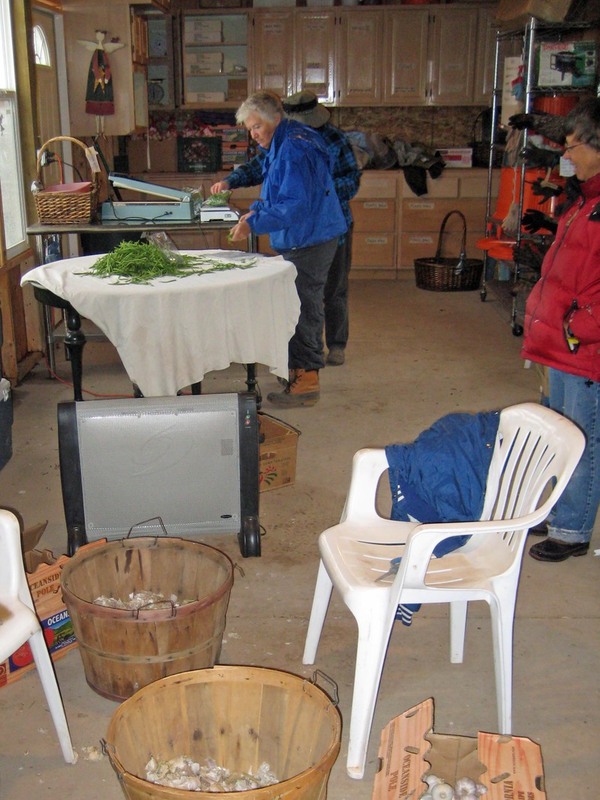 Then on Saturday, before the heavy rains came, we had them cleaned, sorted, boxed, and taken down to the basement. And I dare say we even had fun while doing it. The only disappointing part is that the potato yield was down by about 500 lbs. from what we got last year. This wasn't really a surprise to us, it follows along with how so many other crops have grown this year. Still, I think we have a really nice load of potatoes to give with your shares for the remainder of the season, starting next week. We just won't have any extras to sell like in years past. My picture of the week comes from this past weekend's potato harvest. Do you see what I see? A shapely body, two arms, eyes, mouth (with red lipstick even), and green headdress? There is a nice bounty of yellow onions in your bag this week. I suggest making French Onion Soup. Also, I added another recipe for the fillet beans, Haricot Panach. I've had some fun taking pictures of vegetables this past week. Carrots do amusing things under the soil. Can you count how many carrots have grown together here? Mostly I've been captivated by the tomatoes. I really like tomatoes. This is one big tomato blob. How did that happen? I've been watching this pair of heirloom tomatoes ripen on the vine for weeks. Finally they are ready to pick. Picking tomatoes and leaving a trail to pick up behind me. And this is what my sweet husband picked just for me last night. This variety of heirloom tomato is called "Black". It is our first year growing this variety and we've been eager for one to ripen so we could taste it. Taste-testing is a tough job, but someone has to do it. "Black" tomatoes are actually more red-brown with darker stripes on top coming down from the stem. The flesh is also dark. The taste? OH MY! This is now our favorite tomato! It is incredible! The flavor is smooth, rich, and sweet. I've never tasted a tomato quite like this. There's a whole row of them in the greenhouse. Right now they are all green. We sure hope they start turning soon. You will love them. We are already scheming ways to get these plants started much earlier next season. They'll be worth the extra effort. That's all my pictures. Now for the news. Last Saturday was our last week selling produce at the Jackson Hole Farmers Market. Thank you to those who stopped to buy produce and say "hello". We appreciate your support. The CSA season is still going strong. We still have lots to harvest and have every intention of keeping the veggies coming to you through the end of October. Weather permitting, we will start harvesting the potatoes this weekend. This is another one of those big jobs that is made easier with lots of workers. If your not too busy, come join us. Then the next weekend we'll start planting the garlic. Whew... I thought the work was supposed to start slowing down a bit. Nope. Not yet. After that? We start cleaning up. Lot's to do before the snow flies. But for now, let's all enjoy the sunshine. *I've been a little hesitant to harvest the cauliflower for your CSA shares. Why? Because it's "ugly". We don't like to give out produce that is less than ideal, instead it goes to the pigs. Then this weekend I asked a few CSA members if they'd mind getting "ugly" cauliflower with their shares. I was told "We want it" and that you would all understand. Then to further seal my decision I saw another farmer selling cauliflower that was just as ugly as ours. Perhaps I'm just being too picky, after all, it's still good to eat, especially in soups, or covered with a sauce, or cut up into tiny pieces (there are several ways it can be prepared to hide it's "ugliness"). So what happened to the cauliflower? The extreme fluctuations in temperature have affected the head growth. Instead of having a nice tight, creamy head; it is more separated, prickly, and cream colored with purple spots. Interesting. Shain did some research too and turns out this is a common problem with growing cauliflower. Oh, by the way, we soaked that cauliflower for over an hour and then sprayed each head individually. If any bugs make it through that process I'm terribly sorry, but not surprised. Speaking of temperatures, brrrr it's getting cold at night! Ever since the surprise freeze of a few weeks ago, the snow from last week, and the dangerously low temperatures each night this past week, we have started taking extra precautions. This is greenhouse #2, inside are 2 rows of fillet beans, 2 rows of basil, and about 30 pepper plants. Every night we carefully pull this very large, heavy-duty row cover over the crops, and then take it off again then next morning. 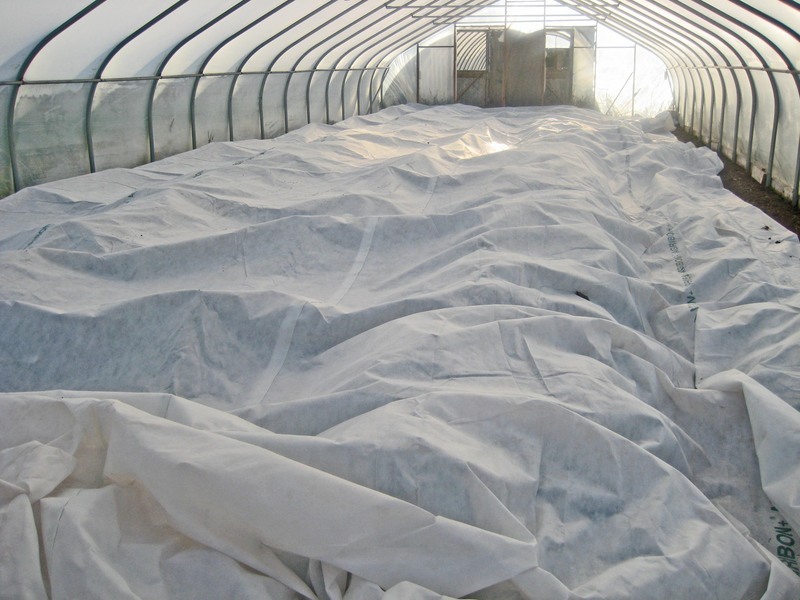 The extra insulation keeps the plants from being damaged by the hard frosts. We are doing something similar inside the tomato greenhouse. 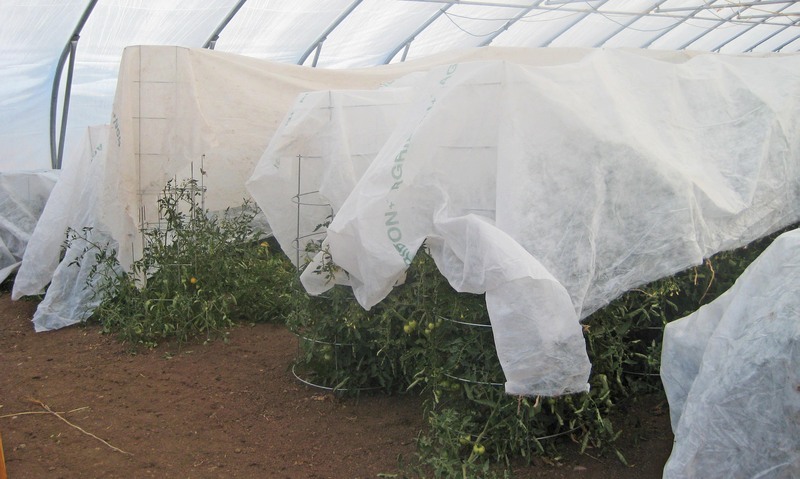 However, with the tomato cages, we can't pull one large cover over all the plants at once. Instead, we put individual covers over the top of each row. To give you some idea of what this job involves, I need to tell you that there are 7 rows of tomatoes, with some tomato cages that are taller than I am, and the rows are about 90 feet long. I took this picture by lifting the camera above my head for a different perspective. In years past, the damaging frost starts taking it's toll on the tops of the tomato plants, before killing the whole plant. But so far this year, the plants still look really good! We also run two heaters inside this greenhouse to keep the temperatures above freezing. This is a lot of work and effort, but we are still hoping for a large harvest of beautiful vine-ripened tomatoes. We really appreciate the kind and supportive words we have received from so many of you recently. Thank you! It's been a good year for garlic. Now it's time to sell it all. 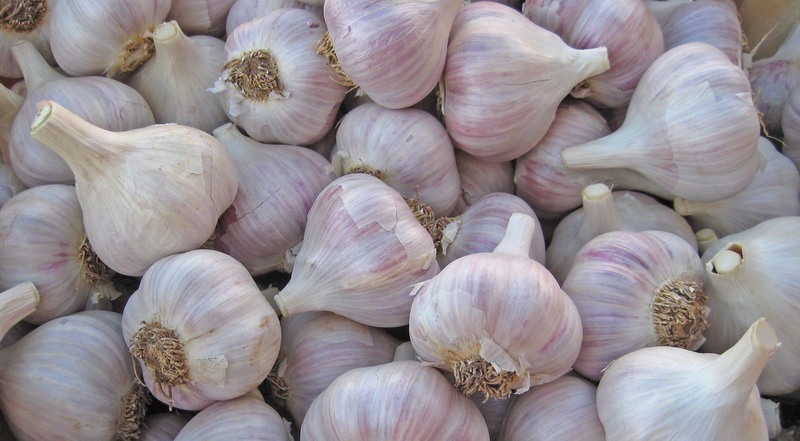 German Extra Hardy - Grade A - has a full-bodied flavor, large bulbs and individual cloves, excellent for roasting, "brings on the heat"
Prices vary depending on how and where you buy it. 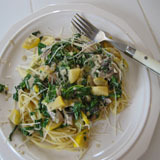 Garlic can be purchased at Familee Thriftway in Afton, Valley Market in Thayne, and Alpine Market in Alpine, WY. We also bring it with us to sell at the Jackson Hole Farmers Market, on Saturdays through Sept. 13th. Or, for the best cost, you can make purchases directly from us here on the farm. Shipping is available, but at your own expense. The weather has taken a predominant role in the farm work this past week, starting with a surprise freeze earlier last week. The damage is visible in many places around the various fields and even inside some of the greenhouses. We know the temperatures are going to drop sooner or later, but so soon already? Then THIS on September 1st. And having snow on a harvest day makes for some changes in our harvest plans. But luckily we have a back-up location for washing vegetables. 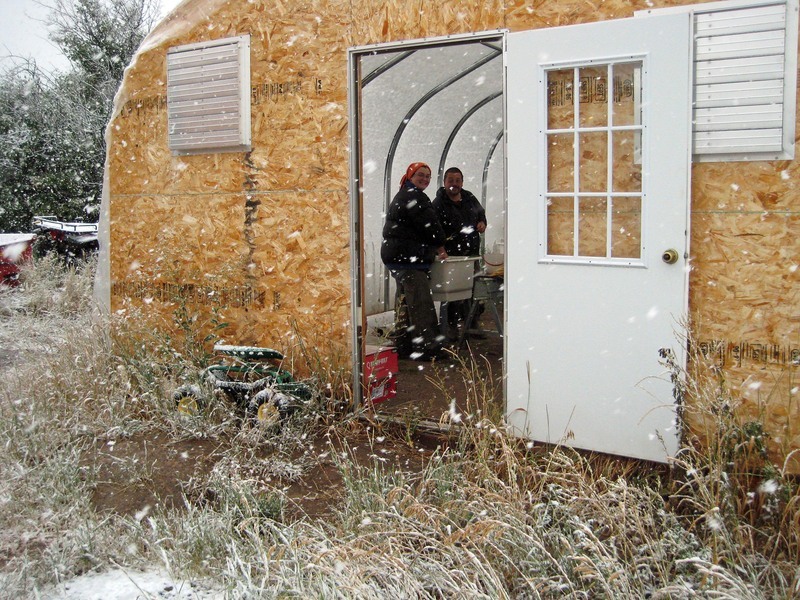 Here's Shain and Nicole washing carrots inside Greenhouse #3. They were the brave souls of the day. We have plans to convert the front section of this greenhouse into a washing area for the days when it's just too cold to wash outside. Looks like we'll be implementing those plans sooner than we thought. Where was I during the storm? I was working. I mean someone has to supervise. It just so happens I was supervising the work being done inside my new favorite farm building - we call it the "Processing Shed" because it is where we bag up and put together our produce, and your CSA shares. It's not much to look at, but it's SO much better than what we've had in years past. Little things like an electrical outlet, lights, windows, cabinets, and a heater make our work more enjoyable. A very big THANK YOU to Workshare Steve Piepenburg who ran the electrical wires into the building a few weeks ago. Every time I switch on the lights I'm a very happy girl. Also, MANY THANKS to another Workshare, Cal Demler, who finished off this building for us. Having walls and doors is a splendid thing. Salad Mix - frozen this week, hopefully it will recover for next week's share. Cucumbers - I think we finally got one to everyone, and just in time. They have been hit hard by the cold and I don't even see any small ones left on the vine. The cucumbers didn't do so well this year. Peppers - these plants have also had troubles growing, even in the greenhouse. I think they must have been stunted at the beginning of the season. They still aren't over a foot tall. There are a few pepers growing, but many that have already frozen. Zucchini & Squash - frozen and most likely gone for the season. I think we did a much better job keeping the sizes smaller for you this year. Tomatoes - haven't been hit to hard by the cold yet. We are doing everything we can to keep them warm enough at night. The plants are loaded, but not even 1/2 of the tomatoes have started to turn yet. Anyone up for some fried green tomatoes? Basil - Also quite damaged by the cold. But I'm covering this up extra well with hopes that it will come back enough to give you more when the tomatoes come on. Broccoli - This did very well this year. Last year we had a complete crop failure with the broccoli and cauliflower, but this year it's looking good. It doesn't even mind the cold too much. Fillet Beans - they don't look so good. We picked all we could on Saturday because some had already frozen and we knew there was more cold to come. 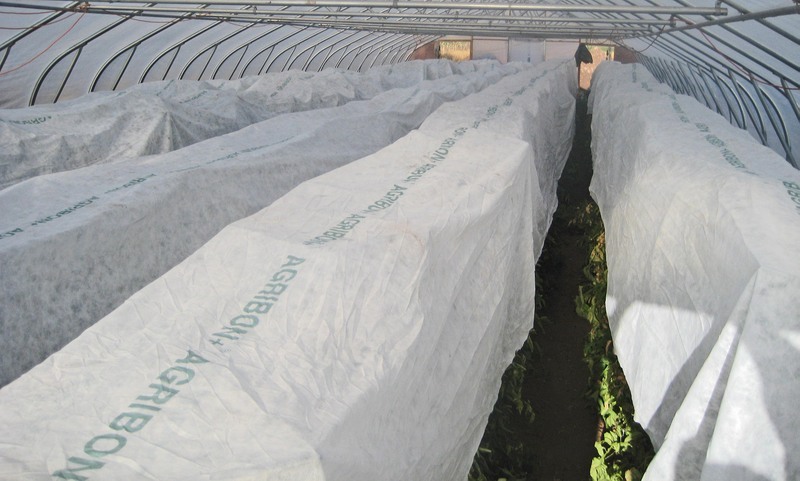 There are still several rows that aren't ready yet, the leaves are frozen on top but we have them double-covered in hopes they'll make it through the cold.